Pleurodires, or side-necked turtles, are found mainly in the southern continents, Africa, South America, and Australia. Their distribution may reflect the drifting of continents, and some workers suspect that they may have reached their present homes by passing over Antarctica, before that continent was covered with ice. 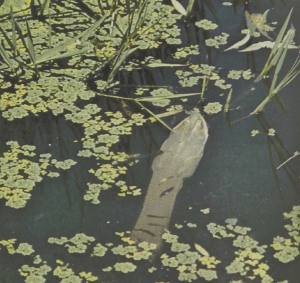 Two major groups, the short-necked and the long-necked pleurodires, occur in Australia. 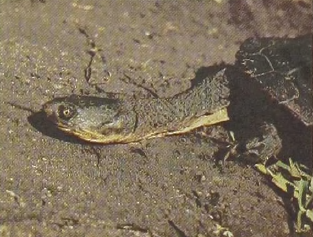 One representative of the long-necked pleurodires occurring in Australia is this common Snake-necked Turtle that lives in the swamps and marshes, rather than rivers and lakes, of eastern Australia. Like many aquatic turtles it feeds mostly on animal food, taking small fishes, small frogs, shrimp, and snails. The long neck allows the turtle to dart forth at prey; equally important, it allows the turtle to breathe by snorkeling: resting on the bottom, the turtle can stretch its neck to the surface and withdraw it again without having to leave its hiding place or swim upward.